I'm a bit of an MLP fan, obviously. I was invited by evilbunnyfoofoo because she liked my Fluttershy avatar on Facebook. HIya Centauress! I'm super stoked you decided to join up. So tell us a bit about yourself. Do you collect, just watch the shows or both? What's your favourite generation of toys? And most importantly... will you give me candy? I'm 46 years old. I'm a big fan of Friendship Is Magic, and I just watch the shows. I'm on disability so collecting is difficult at the moment. I think I definitely prefer the latest generation, the stories seem superior to me. I've also been a huge Doctor Who fan since I was eight years old, and one of the things that really appealed to me is the character of Dr. Whooves. I get very excited every time he appears, I confess. I love that he's been wearing Tom Baker's scarf of late. I've always been a bit of a cartoon junky, but got into MLP late in life. Oh you and I have a lot in common already! I'm a huge animation fan, from everything to anime, Saturday morning cartoons, classic animation to artsy fartsy animated films! I just love animation of all types. Can't get enough of it. And Doctor Who has long been a love of mine, since PBS started showing the Tom Baker episodes back when I was a kiddo (I'm four years older than you!). Whooves quickly became a fave of mine as well when I saw they were really using him as an homage to the show. I know budget constraints can really put a dent in collecting. I spend so much on animal feed that I had to curtail my comic purchasing (a lifelong passion), but have managed to have a little budget for Ponies and the odd action figure. Typically I try to find it all at the thrift shop anyway, because I am super cheapo. Thrift stores are awesomely fun, anyway. Tom Baker was MY Doctor as well, when I was eight I think at 1AM, "The Ribos Operation". I was irrevocably hooked from that instant on. Tom Baker pretty much continues to be my fave. I love all the others, but he was first and just won my heart forever. I've just never had one of the others top him. No one can match his almost maniac enthusiasm. Man, I do love a good thrift store. I think most of us here haunt them regularly, just hoping for some fun find. Mine hardly ever have toys, but I'm always looking and I do also enjoy finding bizarre or tacky knickknacks! Hope it's OK to join in here, just wanted to say yay, fellow Dr Who fans. Tom Baker is one of my favourites too. There was something about him that just worked for the character. Also I liked Sarah Jane as a companion and who couldn't love a metal robot dog? (Well, perhaps the cast who had to work with him, apparently K9 wasn't that reliable a robot ). Nice to know I'm not the only one who was happy to see Whooves wearing the Tom Baker scarf (I thought it was unlikely I would be ). I mostly shop for clothes at thrift stores, but in future I'm going to look at the toys. I adore Sarah Jane and K-9. Have you watched the Sarah Jane Adventures? It's quite good. And K-9 also had his own show in Australia, and while he had a complete makeover and gained the ability to hover, John Leeson returned to do the voice. I think Leeson added a lot of depth to the character. There is a Tekno dog back there somewhere as well, I bought him in the late 90's. I tend to look at books in charity shops here. I do keep an eye out for interesting toys and games too but haven't spotted any ponies yet. Maybe one day. I have watched the Sarah Jane Adventures. I thought they were pretty good too. Considering it was made for CBBC the stories were interesting and I was delighted that K9 got to have a part in the series too. 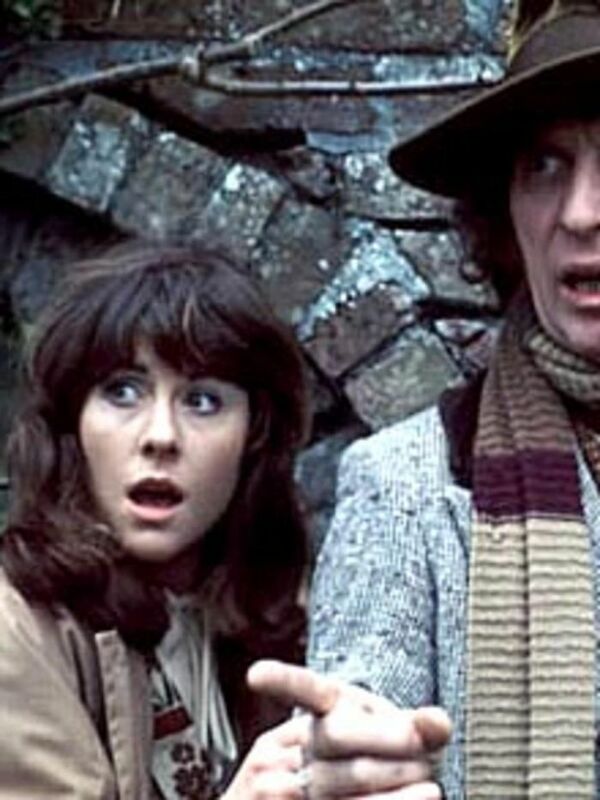 Some of the acting was better than others but Elisabeth Sladen was great throughout from what I remember. I was upset when I heard the news of her death. Now I think about it a Sarah Jane pony tribute could be pretty neat. The David Tennant-like Doctor Whooves has been shown with the pony with the Rose cutie mark so why not a head nod to some of the other companions as well? Journalism related cutie mark perhaps? I've not seen the spin off series that centres around K9, thanks for reminding me I need to catch that at some point. I'll have to check to see if it's being repeated on TV or if it's on Netflix. Leeson was the perfect voice for K9, indeed. Have you seen the School Reunion episode of Doctor Who (the David Tennant one that had Sarah Jane and K9 in it)? That K9 model is so cool and adorable. Had to Google Tekno dog but when I saw the pictures it did ring a bell. Never had a robot dog myself (apart from a very small remote controlled K9 if you count that) but there's some pretty cool and cute ones around. 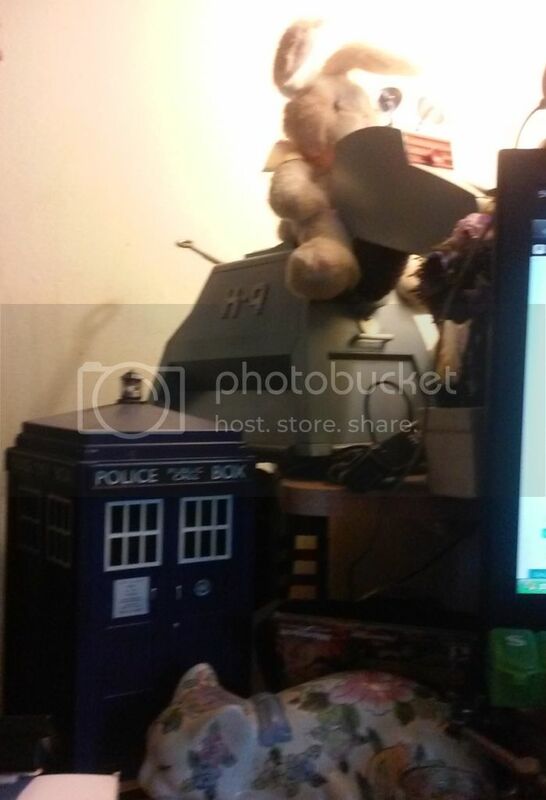 The TARDIS and Dalek are pretty cool too. And are those Lost in Space robots? I think a Sarah Jane pony would be an awesome idea! Yes, her passing was a shock, she kept the condition secret. Always my fave companion. And, yes, I've seen "School Reunion", and "K-9 and Company". This site is showing as currently under maintenance, but I expect it will be available within a couple hours. I watch a lot of different television shows using it. There are a lot of ads, some of which are adult in nature, I recommend AdBlock Plus. I just liked the Tekno when it came out. I would have preferred a K-9, but at that time none were available. My Tekno has been played with, but well cared for, and spent most of his time on display on a shelf and a decade long stint in storage, so he's in near perfect condition. The K-9 I have is R/C, and I love him to death. He was made after "School Reunion" and says some of the lines from that episode. Everyone just falls in love with him when he says "Maximum Defense Mode!" so gleefully. When I finally found out about them production had already ceased, and I ended up scouring eBay for a used one in good condition that I could afford. I was working at the time, but I spent more than I could really spare, and had to cut back on lunches for weeks. 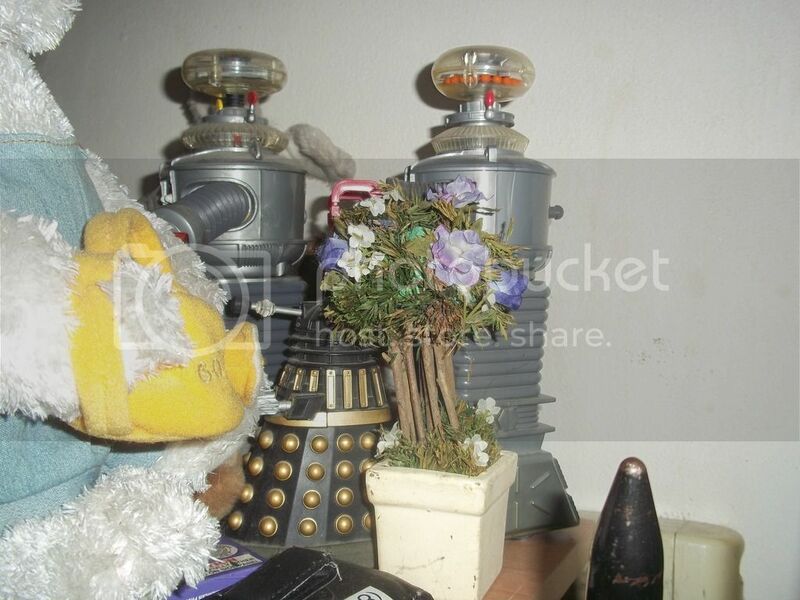 But I bought him (and the Dalek) from a man in England, and had him shipped to the States. I have a video of me putting him through his paces on YouTube, if you are interested. And yes, those are Environmental Robot B-9's (aka "Blinky") from "Lost in Space". No one ever remembers his name. I've been looking for a Robbie the same size, but they are expensive. I do have a perfect Hallmark ornament of Robby that talks, there are vids of all three on my YouTube Channel. If I can come up with a good idea for a design a custom Sarah Jane pony might make a fun project. I've already made a custom Doctor Whooves so it'd be nice company for him. and it would be an excuse to make a tiny little K9 to sit with them. (The model one I have is the wrong scale to go with the brushable sized G4s). Spoiler for School Reunion (which is why I asked if you'd seen it before I said anything), the bit where the Doctor's leaving K9 knowing that K9 probably isn't going to get out of the school and he says "you're a good dog" and K9 says "affirmative", that was such a sad moment, and the way Leeson said that catchphrase in that bit, it was so right and lovely. It's lovely to have toys you like kept in nice condition. Is the Tekno dog one of the ones that does tricks and stuff? I know some robot dogs do react to voices and some don't. I think interactive toys can be rather cool/fun. I have a plush toy Stitch (from Lilo and Stitch) who responds when you ask him specific questions, it still amuses me and I've had it for a long time. I'm easily amused. Your remote control K9 is ADORABLE! He's even more cute when he's talking and in motion. The way he even waggles his ears is so cute and sweet! I can see he's so neat he'd be worth making some savings on some things for a while to get. Have to admit that I've not actually watched Lost in Space but I know a little about it and thought the robot looked like one from it, nice to know I got it right. Some of the classic sci-fi robot designs are really neat and interesting aren't they? A talking Robbie sounds fun. That sounds a cool project indeed! You should actually send the finished design to the show's producers, I think that they would like it. I totally agree about Leeson. And when the baddie says "Bad dog! ", the way he so cheerfully says "Affirmative!" The Australian show is geared to a younger audience, but I watched the entire show and thoroughly enjoyed it. "Classic" K-9 appears in the first episode, in which he is overwhelmed by baddies and forced to self destruct. But he had a regeneration unit added at some point, presumably by the Doctor, and he repaired himself with an all new high tech look. And I liked the other characters, it was a great show. I totally LOVE my K-9, thank you! I'll never get rid of him. They actually have a new model out now, I want one of those too, but can't afford it. And I really want the latest incarnation of B-9, as well. Yes, that's the Tekno. This one is exactly like mine. I haven't batteries in mine, and in fact it hasn't had any batteries installed since the first year I had it, lol. I really need to get some batteries and fire him up and make a YouTube video. Yes, B-9 was an absolute classic or robot design. He was designed by Robert Kinoshita who also designed Robby, and it was he who called him "Blinky", a name which was never used on screen. B-9 was later redesigned and used on another show, but has since been restored to it's original condition. During the restoration, they made molds of the parts and now building your own B-9 is actually a thing, there are clubs to help you get started. The Genuine 7 Foot Robby The Robot. Combining two things I like, Doctor Who and ponies, in a creative project that works as a kinda little tribute to an actress I liked, good combination. If I do ever come up with a design that I think would work it'll go on my projects to do list. I think a cutie mark of a reporter's notebook and pen would work well but not sure about mane and body colours and mane and tail style. Something to think about though. That bit was great too. K9 did sound so cheerful, happy he got to be a hero and save everyone perhaps. Tempted to watch that episode again now I'm thinking about it. I don't mind watching a series where the target audience is younger than me if it's good. I'll happily admit to watching the new episodes of the Clangers that have been on the BBC recently. They're adorable, especially the soup dragon. I thought the puppets were lovely on Bear in the Big Blue House and when I watched that I wasn't in the target age group either. I'm the same with books. There's so many great things out there, if you're open minded about things there's even more you can enjoy. I like the idea that K9 gets to regenerate too. There's something rather nice about it. Plus if it means that more good stories get to be told with him in them even better. Thanks for letting me know the show is good, I'll look forward to watching it at some point. That version of the Tekno dog sorta looks a tiny bit like the new design K9 (the one that hovers), that's pretty neat. Plus the fact that the ears waggle and the tail wags is rather cute. Makes sense that both those robots were designed by the same designer. That's really neat that the B-9 got restored and people are making more of them. I could imagine that a working, moving and talking robot like that would be lots of fun and make lots of people smile. Especially if people heard it go "Danger Will Robinson!". I think the pen and notebook is a great idea. I'd certainly love to see the finished product. My own artistic talent can be measured in negative integers, so I can't help. One problem, is that that K-9 is only available in the U.K.. That's not insurmountable, but remember that International shipping will have to be paid as well. That adds a good $30 or so to the price, and the exchange rates are always fluctuating, so there is a bit of a variable. Like I said, it's a complication and added expense, but not really a problem if you are willing to pay the money. Mine came from South England. And the one like mine is now selling on Amazon for over $600, so you can consider it an investment. That was the excuse I used to justify it, though of course I was lying to myself, I'll never part with him. He also sat on my desk at work along with one of the B-9's for two or three years, and everyone loved him, including the boss. The video was actually filmed in the office after hours. The company I worked for was a courier company who's primary business was delivering scripts to the studios, and Fox was one of our big contracts, so I justified it by claiming that the robots were well established television icons, and B-9 was one of Fox's claims to fame. That went over well with the management, actually, because they sometimes had clients visit the office and were initially concerned over clutter. The one B-9 who stayed on my desk has a movement sensor, and I left him on that setting one night, and I came in the next morning and the night dispatcher told me that the cleaning lady passed by my desk late at night, and he lit up and said "DANGER, Will Robinson!" and she actually ran out of the room, can you imagine? The full size B-9's and Robby's don't actually move about, the torso swivels and they talk. That's probably for the best, as I would be devastated if he got damaged bumping into something, they cost as much as a second hand car. Of course the originals were costumes with an actor inside, and on the show B-9 was pulled by wires. Apparently he was originally supposed to walk like Robbie, but the costume cut the actor's legs, so they put him on treads and bolted the legs together. I remember one episode when he walked up steps, and I thought it was cool. And yes, Tekno is cool! I'm pretty useless at drawing but am better at 3D things, like sewing for example. Sometimes when I'm trying to describe to my husband how I'm planning to make a costume or prop or something I find it's better to make a little model rather than try and draw it, or just tell him "it works in my head, trust me". XD (He knows if I've worked out how I'm going to make something in my head it'll usually work). I've always been pretty neat with colouring in and I've found that applies with paint so painting a custom is fine, just don't ask me to draw a pony. XD One of my friends who paints customs gave me the tip of using pins for painting the tiny details like cutie marks. I use toothpicks but they work fine in the same way. It was really nice to see that tiny little hourglass take shape on the Doctor Whooves custom and very satisfying to see it turned out quite neat when I finished. Haven't taken a photo of him yet, must do that at some point. That's a shame the K9's not available outside the UK. I'd imagine he'd probably be popular in other countries as well and Toys R Us has stores has stores in quite a few countries as far as I'm aware. I'd imagine the shipping on a K9 that size would be quite a lot because of the weight, indeed. Luckily I'm in the UK so that would help keep the shipping cost down. Even if you won't ever part with him he's an investment in happiness, you could see it that way I guess. If he makes you and the people who you show him to happy then that's worth a lot perhaps. The way he waggles his ears and so cheerfully calls out catchphrases, how could anyone do anything but smile when they saw that? If everyone you worked with liked him that's really lovely, bringing smiles to where you work I think. That's cool that you got to have such neat things on your desk and that they tied in with what the company did. Poor cleaning lady. Amusing story but I can imagine it must have frightened her before she knew what it was, especially as the message included "danger!". Naughty B-9, frightening people. I can see that would be a positive point, less chance of them being damaged the less they move about. Wonder what it was like to be inside those costumes. Probably rather uncomfortable I'd imagine but how neat to be a part of classic TV history. Yes, after that incident I was instructed to keep him turned off during business hours. They didn't like the clutter on my desk, but I'm one of those people who needs clutter and interesting things on my desk, I don't feel comfortable without it, and my productivity suffers. I also always had a few vintage lighters, which I collect. Most people were amused by that, as I don't smoke. I also always kept a spare set of car keys on K-9's tail, just in case I went out for lunch and someone needed to move my truck, being a courier company cars and trucks were constantly coming and going and being moved about. And everyone was always borrowing my portable air compressor, things like that. Neat that he could light up and speak though, bet that was fun to show people when they knew to expect the robot to do something (and he wasn't just calling out and lighting up without warning). If they made people smile and had a connection to the work I'd argue that's not clutter. I think one or two things that are fun/special to you on your desk is nice, makes the space more yours if that makes sense? On the computer desk I'm using now (at home) I've got a couple of things other than the practical stuff like the speakers and pens, including a cute little horse plush toy who's sitting happily on the top of the monitor. He's not a My Little Pony horse, just a random little plushie I found that was just so adorable he made me smile and as he was so cheap I couldn't say no. Makes me smile when I see him sitting there. I hadn't thought of that before, but K9's tail would be perfect to put stuff like keys on. Great when something is both practical and decorative at the same time. That's nice you were able to do that, very considerate. My desk at home is just covered with interesting things that I like, I just prefer it that way. This is my Hallmark Robby, this one was filmed at home. In the background you can see a 1930's Bowers lighter, a couple toy soldiers I got at Shakey's Pizza on my birthday a couple years ago and several Zippos, one silver plated. There is a rainbow colored unicorn Beanie Baby to the left, you can see just part of it. I'm quite enjoying this conversation, thank you. Those B-9s and the Robbie are really cool. The fact that the second one even moves around is great, and having them all say phrases is so fun. Particularly liked "For your convenience I am programmed to respond to the name Robbie". Quirky in a fun way somehow. I'm thinking I really should probably watch some Lost in Space at some point too. I was hoping to get some recommendations for some sci-fi things to watch when my husband and I have finished watching the last series of Continuum (we've just got the last two episodes left) and I've watched the X-files (which my husband has watched all of but I've only seen the new episodes that were on TV recently). The K9 show and Lost in Space go on the to-watch list. (My husband's seen some Lost in Space but says he's happy to watch it again, along with the X-files ). Is the Lost in Space film that was made in the 90s any good or is it one to avoid? Our computer desk has had various pony things on it recently, I've been trying to identify things I got in a couple of bundles of ponies and accessories. Been fun doing the detective work although I've still got a few things which I still don't know what they are (or, I'm wondering, if they're even pony items). The little horse plushie lives on the monitor and there's usually interesting figures, plushies and craft things (stuff like things I've made from Hama beads, including some we use for coasters) around. It's nice having stuff like that around isn't it? I still have some beanies too. Most recent TY things I've got are the small and a bit larger (the one that's a little bit smaller than the Build a Bear plushies) Fluttershy plushies they made (the ones without the tinsel in their hair) but most of them aren't that recent. One of my favourite animals is rabbits, so I have quite a few of those. A rainbow coloured unicorn one sounds cute, don't think I've seen one of those. I'm enjoying it too. Thank you for sharing so many cool robots.